Clutter is the last thing one wants in a kitchen, where already there is so much to keep, take out, shift and clean. Cooking being a meticulous task, it requires that we have the kitchen items neatly organized in their respective places; else it may affect not only our cooking process but also our food. This is where kitchen cabinet organizers are of prime importance and should be selected thoughtfully. There are numerous things in our kitchen that need to be organized — like cutlery, dishes, cookware, glassware, tea cup sets, kitchen tools, spices, napkins, plastic bags, serving trays, big and small appliances. And therefore we need various kinds of kitchen cabinet organizers, so that we don’t end up having too many things in one cabinet or drawer. Kitchen cabinet drawer organizers can be used to stack small items like cutlery, spice jars etc. in top drawers or cookware, dishes etc. that are stacked in big lower drawers. For cutlery, four to five sections separated by long dividers are good enough to keep them sorted. Same is the case for spice jars and other small kitchen tools. Kitchen cabinet drawer organizers for cookware need to have broad sections separated by one or two dividers. Roll-out steel drawer organizers are also a good option for stacking cookware. The corner kitchen cabinets are the hardest to reach and keeping stuff sorted in them is of prime importance. Corner kitchen cabinet organizers are readily available and can really make the task of accessing items very easy. Multi-layered semi-circular turntables, also known as Lazy Susans, are good corner cabinet organizers. The top shelves can have smaller Lazy Susans while the bottom shelves can have larger Lazy Susans to accommodate big pots, pans and other cookware items. Also useful are V-shaped drawers that slide in and out easily without getting stuck. However, they need to be considered while you are installing your kitchen cabinets. Kitchen cabinet shelf organizers are really important as most of the times we stack food items in shelves and forget their arrangement leading the entire stuff in mess. To avoid this, you can opt for a sliding out steel rack that has a single partition. This is ideal for stacking snacks or even tea cup set etc. A staircase rack that can be inserted into the shelf is ideal for storage of sauces, food cans and jars etc. There are different kinds of under-the-shelf organizers also that can be ideal for storing coffee mugs, foil paper roll, kitchen napkins etc. Under-the-cabinet organizers are available even for wall cabinets, which are great for storage of frequently-used spice jars or other ingredients like herbs etc. Kitchen cabinet dish organizers come in varied designs depending upon various storage needs. It can either be exclusively used to stack plates or for stacking plates, bowls, cups and saucers. They come in peg style and rack style. Peg style dish organizer can be incorporated into the drawer itself. 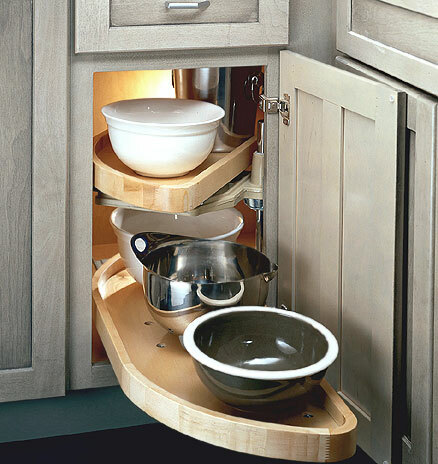 By using these kitchen cabinet accessories you can keep your dishes safe and scratch free. Both the peg style and rack style are available in roll-out rack design for easy access. A cabinet or drawer becomes highly functional and easy to use once few or all the above kitchen cabinet organizers are installed. Before finalizing them however, you should enlist all the items that currently occupy your cabinets. Some people may require wine organizer while others may need more of snack organizer. Depending on your need select the ones that not only fit your budget but also are highly functional and very easy to use. or check them at a local kitchen hardware store. Cooking being a meticulous task, it requires that we have the kitchen items neatly organized in their respective places; else it may affect not only our cooking process but also our food. This is where kitchen cabinet organizers are of prime importance and should be selected thoughtfully. Very nice post on kitchen cabinet organizers! What an interesting and detailed coverage! Amazing photo as well! Well done! I really liked the design! With all the lights and everything. I also like the hidden aspect! Our small countries have not seen so much stuff like that!